The old town of Vegueta in Las Palmas de Gran Canaria is where all historical and architectural tales begin in the island. As such, it is a bustling district filled with sophisticated Spanish architecture, lively cobblestone streets, and surviving religious traditions. Yearning to escape the coldness in Europe? Step into the warm embrace of the incredible history and quaint elegance of Vegueta. Apart from picturesque old neighborhoods, an array of charming shops, culture-filled cafes, interesting museums, and a vibrant night life welcome tourists. 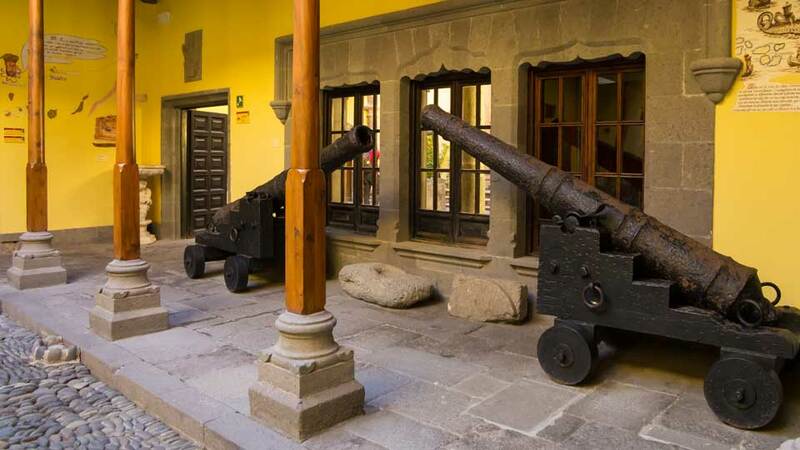 It all began in the 15th century when the Castillian army first set foot on Gran Canaria and established a military base. Set at one side of Guiniguada ravine, the natives and the Spanish colonizers fought many battles here. The Spanish named the first settlement Real de Las Palmas, and from this settlement, the town of Vegueta was born. As Las Palmas bloomed to become the bustling capital that it is today, Vegueta remained true to its colonial roots, keeping numerous religious and architectural intact. Together with Triana, the district earned its place on the list of desirable European tourist destinations in the Canaries. The old town of Vegueta is a striking reminder of how its past has shaped Las Palmas. Stepping on the old streets, one could not help but be captivated by its Spanish charm. The fool-proof way to absorb the extraordinary vibe in Vegueta is by having a leisure walk. Not long after visitors venture in its cobblestone streets, old churches and lovely houses with wooden balconies greet them. Visitors who dine al fresco in one of the many charming cafes have fun people watching or admiring the Neoclassical and Renaissance architecture of most mansions, theaters, and museums. Most streets like Calle Triana are closed for pedestrians making it the best place to walk back in time. Amidst the old buildings in the town, the Santa Ana Cathedral stands out. The twin towers of the church are an unmistakable landmark of the city. 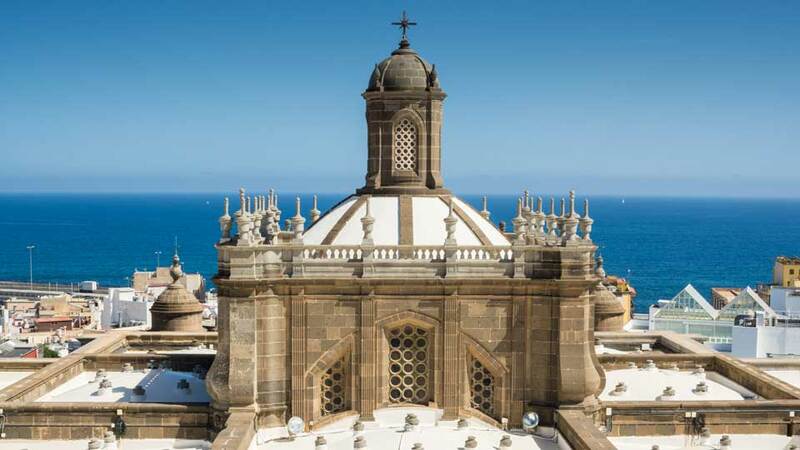 From one of the cathedral towers, visitors could see a fantastic 360 view of Las Palmas. The Gothic architecture of the church outside gives way to a Neo-classical, as well as other different styles that define its pillars and ceilings. Apart from religious figures, 17th and 18th-century paintings adorn its walls. One of the best places to take a break is at the Santa Ana Square. Here, visitors could sit down on a bench or feed the pigeons. Watching over the square are eight bronze guard dogs. For a peaceful afternoon away from the crowds, the smaller Plaza del Pilar Nuevo and Plaza del Espiritu is nearby. At Plaza de Santo Domingo, the settings in romantic plays come to life with an authentic 18th-century fountain. The church here serves as home to many statues used during religious processions in the city. The rich history kept in Vegueta bursts at the seams, thanks to the presence of several museums. Casa de Colon or Columbus House is a Spanish style house-turned-into-museum with a lovely courtyard. Among its notable collections are artifacts that link the Canaries to America. Located only two blocks south of Santa Ana Park, Museo Canario or Canary Museum houses the remains of the original inhabitants of the island and other relics of pre-Hispanic origins. Those with a penchant for art exhibits would delight in the artwork of various South American, Spanish, and African artists displayed in Centro Atlantico de Arte Moderno. One of the best things that make Vegueta a perfect destination for travelers is the food. The Italian owned Tres Jolie Las Palmas in Calle Mendizabal serve fantastic pizzas. Together with other restaurants on the same street, they hold Tapas night every Thursday. It is for this reason that the street is renowned among tourists and locals. For a homier vibe, La Dolce Vita in Calle Agustin Millares Torres serves excellent Italian food, and for over two decades, their wine selection has been a popular go-to for tourists. Just in front of Plaza Santa Ana, the main lamb dish that melts in the mouth served by O Soleil should satisfy French food craving. As people around the world either sleep or wake up facing the prospect of another stressful day, the vibrant nightlife in Vegueta begins after midnight. At the Paper Club in Calle Remedios, guests dance to the music of Spanish Salsa. Meanwhile, those who want a more private and intimate evening head to La Azotea de Benito. Teatro Perez Galdos, the most important theater in Las Palmas, is at the end of Calle Triana. It’s the place to be for an evening filled with Canarian concerts and recitals. The classic atmosphere is completed by a bar for drinks and many eye-catching paintings by the famous artist Nestor. The Mercado de Artesania y Cultura de Vegueta is held every Sunday at Plaza del Pilar Nuevo. The market, overlooking the cathedral, is where tourists and locals huddle among the mini-tents filled with native crafts, artwork, fresh fruits, and vegetables. It’s the perfect place to get souvenirs and to taste the local products Las Palmas is proud of. Located just 6 kilometers south of the capital city of Las Palmas, Vegueta is relatively easy to get to. Visitors coming in from the several Gran Canaria ports may opt to ride the service shuttle, take the bus, ride the taxi or drive a rental car. The standard fare for taxis is 1.65€ with additional 0.60€ for every additional kilometer. Standard bus fare is at 1.40€. The Guaguas or the yellow buses take travelers anywhere in the city. The nearest drop-off point for taxis and buses is at San Telmo Terminal. It’s in front of a square that is always busy with tourists and locals. From here, visitors could explore the charismatic Vegueta by foot or by taxi. In the lovely alleys and corners of Vegueta, lovers and families take a relaxing trip back in time. With every Gothic chapel wall, a whisper of its history. With every Spanish balcony, a glimpse into its past. 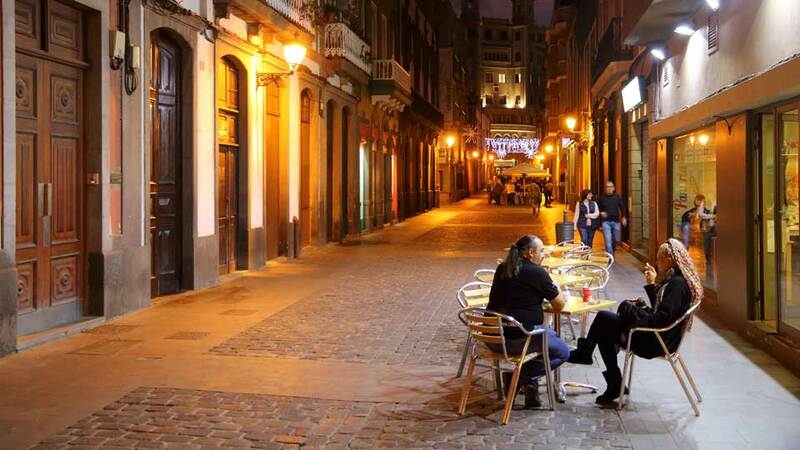 The district which gave birth to Las Palmas, Gran Canaria’s capital, cradles an ancient charm that influences its shops, museums, gastronomy, festivities, and architecture. Don’t just pass by as with every step, experience the century-old beauty of Vegueta.